In the BESM d20 Monstrous, d20-guru Ian Sturrock deconstructs over 100 of the major fantasy monster races to reveal their true point-based abilites and power levels. Additionally, combat tactics are presented for each monster, giving the GM and players insight into the creatures instincts and methods. 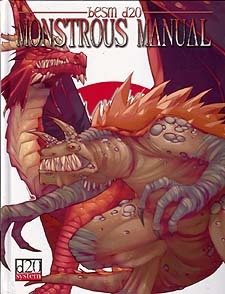 Customised for your anime adventues, but ideal for any fantasy setting, the BESM d20 Monstrous Manual is the ideal creature toolkit and gaming aid.